A comparison of various (a) energy generation and (b) energy storage technologies. Modified from Wachsman et al.11. Reprinted with permission from AAAS with the condition that readers may view, browse, and/or download this Figure for temporary copying purposes only, provided these uses are for noncommercial personal purposes. Except as provided by law, this material may not be further reproduced, distributed, transmitted, modified, adapted, performed, displayed, published, or sold in whole or in part, without prior written permission from the publisher. As shown in Figure A, SOFC’s have some of the highest volumetric and gravimetric energy densities of any energy generation technology; ensuring that they are small and light. SOFC’s have been operated continuously for more than 40,000 hours (~5 years) with only modest degradation.6 SOFC’s running on fossil fuels also have lower CO2, NOx, SO2, volatile organic compound (VOC), and particulate emissions compared to conventional fossil fuel technologies.7 They also require less water than conventional power plants, operate noiselessly, are modular, can supply 1 or 1,000,000 Watts equally well, and provide the increased reliability/blackout avoidance/grid support/homeland security that comes with distributed power generation. (A financial estimate of these benefits can be found here). Taken together, the unique combination of fuel flexibility, high efficiency, and high energy/power density indicates that SOFC’s have the potential to reduce the environmental impact of today’s hydrocarbon based economy while simultaneously providing a path toward a CO2-neutral economy running on hydrogen or biofuels. This strategy is especially appealing for the United States because natural gas is projected to become the most-used domestic fuel by 2030,8 the U.S. is projected to become the world’s largest oil producer by 2017,8 the U.S. is projected to become the world’s largest natural gas exporter by 2020,9 and SOFC’s can reduce the environmental impact of fossil fuels today, using existing fuel-delivery infrastructure. As shown in Figure B, the high gravimetric energy and power densities of SOFC’s make them ideal candidates for smart-grid energy storage and electrical load leveling. When needed, SOFC’s can operate backwards, producing fuel and oxidant and using electricity.9 Later, they can resume normal operation, producing electricity from fuel and oxidant. Despite major accomplishments in the development of SOFC’s over the past decade (reducing SOFC operating temperatures from ~800°C to ~600°C,1,10 consistently demonstrating power densities in excess of 1W/cm2 at 600°C and above,11,12 reducing SOFC stack costs from >$1500/kW to ~$150/kW,3 etc. ), and increasing lifetimes from 15,000 to 40,000 hours,6 many challenges remain. For instance, improved SOFC materials properties and microstructures will allow low temperature (200-500°C) SOFC operation and the associated benefits of improved thermodynamic efficiencies, longer service lifetimes, rapid start-up times, and cheaper balance-of-plant costs.7 At the moment several different approaches to this problem (including nanostructured thick-film SOFC’s, thin-film micro-SOFC’s, strain-engineered materials, etc.) are being pursed and it is currently unclear which technologies will ultimately prove practical. One thing which is clear, however, is that SOFC development in the United States has suffered from federal support that was inconsistent and/or dependent on tangentially related, politically sensitive clean-coal/FutureGen/SECA initiatives. With the scrapping of the DOE SECA program, the unjustified exclusion of SOFC’s from President Obama’s "All-of-the-Above" Energy Policy, SOFC leadership slipping to Japan,13 the political disgrace accompanying the development of other energy conversion/generation/storage technologies (the bankruptcy of battery maker A123, the Dreamliner battery debacle, the failure of solar panel maker Solyndra, etc), the recent increase in domestic natural gas supplies, the continued worldwide use of hydrocarbons, and President Obama’s push to create a Clean Energy Security Trust, now is the perfect time for a Solid Oxide Fuel Cell Promise, Progress, and Priorities (SOFC-PPP) Workshop to re-evalaute the technical promise and funding mechanisms of SOFC research. Note: The opinions expressed here are those of the SOFC-PPP workshop organizer, Dr. Jason D. Nicholas, and do not represent those of the National Science Foundation, the U.S. Government, or any other organization. 1	Steele, B. C. H. & Heinzel, A. Materials for Fuel-Cell Technologies. Nature 414, 345-352,(2001). 2	E.G.& G. Technical Services. Fuel Cell Handbook. U.S. Department of Energy, Office of Fossil Energy, (2004). 3	Wachsman, E. D., Marlowe, C. A. & Lee, K. T. Role of Solid Oxide Fuel Cells in a Balanced Energy Strategy. Energy and Environmental Science 5, 5498-5509, (2012). 4	Maru, H. C. National Renewable Energy Laboratory 1-10 kW Stationary Combined Heat and Power Systems Status and Technical Potential: Independent Review.(2010). 5	Hosoi, K. & Nakabaru, M. Status of National Project for SOFC Development in Japan. Electrochemical Society Transactions 25, 11-20,(2009). 6	Blum, L., Packbier, U., Vinke, I. C. & de Haart, L. G. J. Long-Term Testing of SOFC Stacks at Forschungszentrum Julich. 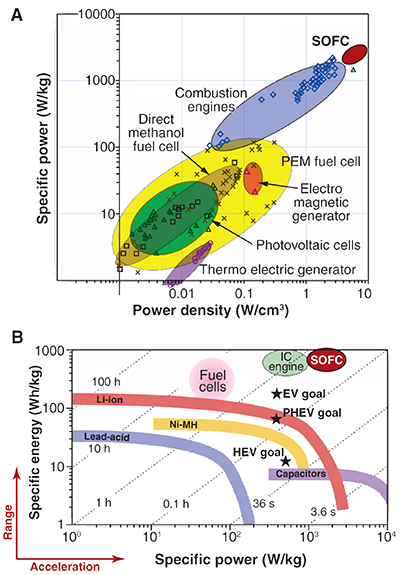 Fuel Cells, Online Early View, (2012). 7	U.S. Department of Energy. Fuel Cell Handbook. 6th edn, (2002). 8 Association, I. E. World Energy Outlook 2012. (OECD Publishing, 2012). 9	U.S. Department of Energy Energy Information Administration. Annual Energy Outlook 2013 Early Release: http://www.eia.gov/forecasts/aeo/er/index.cfm. 1-16, (2013). 10	Herring, J. S., O’Brien, J. E., Stoots, C. M., Hawkes, G. L., Hartvigsen, J. J. & Shahnam, M. Progress in High-Temperature Electrolysis for Hydrogen Production using Planar SOFC Technology. International Journal of Hydrogen Energy 32, 440-450, (2007). 11	Wachsman, E. D. & Lee, K. T. Lowering the Temperature of Solid Oxide Fuel Cells. Science 334, 935-939, (2011). 12	Suzuki, T., Hasan, Z., Funahashi, Y., Yamaguchi, T., Fujishiro, Y. & Awano, M. Impact of Anode Microstructure on Solid Oxide Fuel Cells. Science 325, 852-855, (2009). 13	Behling, N. H. Fuel Cells: Current Technology Challenges and Future Research Needs (Elsevier B.V., 2013).